Go Metro and save 20 percent on tickets at REDCAT! Actors performing Cineastas via REDCATS official Facebook page. Argentine theater director Mariano Pensotti will bring his latest stage work Cineastas to the Roy and Edna Disney/CALARTS Theater (REDCAT) in the Walt Disney Concert Hall Complex Thursday, Feb. 12 through Saturday, Feb. 21. Cineastas tells the story of four filmmakers and the film they work on together in Buenos Aires over the course of a year. 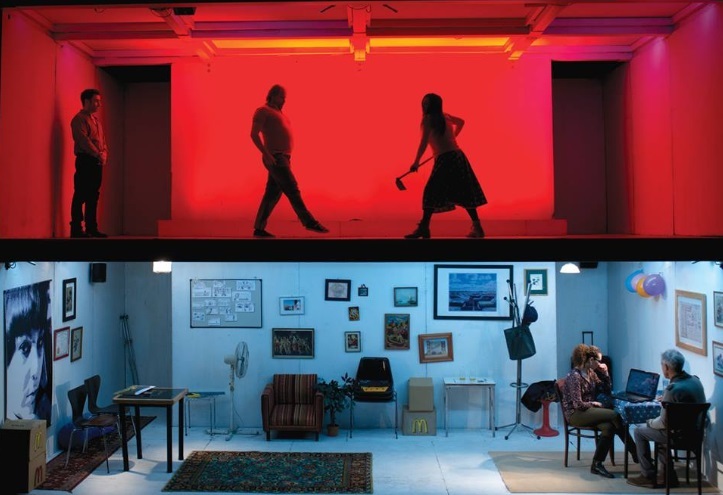 Actors simultaneously shift from their characters’ real lives and their film on a split-level stage illustrating how art influences real life. Thanks to our Destination Discounts program, Metro riders attending any REDCAT event can save 20 percent on tickets or festival passes. Just show your TAP card at the box office to get the discount! And if you’re looking to reduce your carbon footprint, Metro Rail or Bus will drop you off just a short walk from the theater. Take the Metro Red or Purple Line to Civic Center/Grand Park Station or DASH B to Grand/2nd Street. For more route options, use the Trip Planner at metro.net. If you’re attending Cineastas next Thursday, keep in mind the show will be performed in Spanish with English subtitles. For upcoming dance, gallery, literature, media or music events from influential artists around the world, visit the REDCAT website!